From the album WX62 "Scoundrel Days"
Cry Wolf - 'Made in UK' printed at right side + DAMONT etched in runouts (this entry). Cry Wolf - 'Made in UK' printed at right side + ∇420 stamped in runouts. Cry Wolf - 'Made in UK' printed at center. 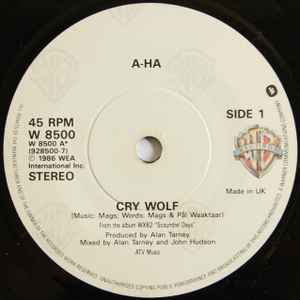 Cry Wolf - 'Made in UK' not stated on labels (Irish).